Soak the rice for 30 minutes. Heat the oil and add cumin seeds and fry rice without water for 2 minutes. Add salt to taste. Add 2 cups of water and boil. Once it starts to boil, reduce the heat and cover the pan and cook until all the water is absorbed. Switch off the heat and after 5 minutes use a fork to separate out the grains and then let it cool. Dry roast the spices till aromatic and let it cool and grind in the coffee grinder. Boil the masoor and when cooked drain out the water if any left. To test if masoor is cooked squeeze some between thumb and finger.If they quash easily then masoor is cooked. Heat the oil and add curry leaves and add onion and cook till soft. Add ginger, chilli and garlic paste and cook for a minute. Add yoghurt, sugar, salt and fresh coconut and dry masala and cook for 3-4 minutes. Add boiled masoor and cook for 3-4 minutes for masala to mix. At this stage you can alter the taste to your liking. In an ovenproof dish apply ghee on bottom and spread half the rice and than make a layer of masoor curry and alternate this till the time rice and curry is utilised. Cover the dish with foil and cook in oven for 10 minutes. Mix oil, onion and sugar in a frying pan and cook on low heat till the time onion is caramelised. 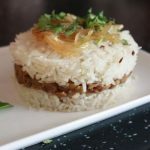 Garnish the biryani with onion and coriander before serving. 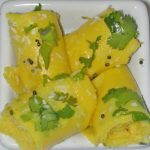 These delicate gram flour rolls spiced with flavoured oil, coconut and coriander makes a really stunning cold starter for all age group. It is an acquired art, so if you do fail first time, please do not give up and try again. Once you have learnt the technique, this will become one of the most impressive dishes in your repertoire. Mix gram flour, water, yoghurt, oil and turmeric powder thoroughly with whisk and pour mixture in micro proof container. Cook covered for 4 minutes on medium high and stir with a whisk. Add salt to taste. Cook again for 2 minutes on high. Spread the mixture as quickly as possible and thinly with a flat spatula on a thin plastic sheet. Brush oil on khandvi and sprinkle coriander and coconut. 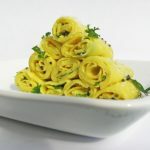 Cut khandvi with a spatula 1 inch wide and roll and arrange beautifully on a serving dish. To prepare tempering heat oil in a pan and add mustard seeds. Let it crackle and then add pinch of hing. Pour this over khandvi with a teaspoon and lastly garnish with coconut and coriander. This khandvi is prepared in a 650 Watt microwave using a microwave casserole. If you have a high Watt microwave, reduce the time by half minute for every 100 Watt.